With the increasing number of video baby monitor with 2 cameras (some extendable to multiple cameras even) in the market nowadays to cater to those that need a baby monitor for two rooms (or those looking for a baby monitor for twins), there is one feature that is increasingly important - the split screen monitor. Sure, 2 camera baby monitor usually allows you to switch the views as desired but that's the thing, you need to switch to be able to look at the other camera's view. A split screen baby monitor, on the other hand, lets you look at two different views simultaneously by splitting the display screen into two (or more). This makes for the best baby monitor for twins, otherwise, the best baby monitor for two rooms in our opinion because you get to check on your twins or children in different rooms/locations at the same time! When it comes to looking for a two camera baby monitor that has split screen functionality, the very first choice many would have recommended is the Summer Infant Dual View Digital Colour Video Baby Monitor. Not a surprise there, considering there are so many summer infant wifi video monitor reviews out there. We have bought one and tested it - we do have to agree that it is definitely one of the best split screen baby monitor. First of all, this comes in a package of two cameras aside from the parent unit which has a 3.5 inch display LCD flat screen that operates on 2.4GHz wireless digital technology. It produces enhanced picture quality and has an automatic black and white night vision that let you can check on baby any time, day or night. While we certainly wouldn't say it is the best long range baby monitor in that its maximum range is up to 600 feet, it is certainly enough for most households especially for those that live in apartments or condominiums. Rest assured that you will be alerted if you ever go out of range so no worries in that department. In terms of its split screen capability, Summer Infant's side by side split screen video monitor set is truly of top notch quality. The dual baby monitor split screen lets you view each room (where you place the two camera units) side by side simultaneously without having to flip from one room to the other. What's even better, is that if you'd ever have the need to add more camera units, you can do so by purchasing 2 additional cameras separately because this split screen baby monitor is able to split into quad viewing mode for you to check on four rooms at once! Other features include two-way audio communication with sound activated LED lights as well as pan, scan and multi-level zooming functions that allows you to remotely scan the room left to right, up and down and all around. 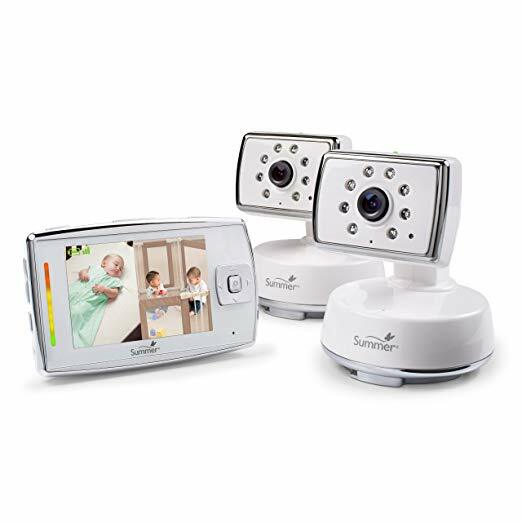 More than just a dual screen baby monitor, the Summer Infant Dual View Digital Colour Video Baby Monitor is no doubt one of the best multi camera baby monitor. If there is one thing that we'd say is a shortfall, is that this summer baby monitor camera's display screen is a tad on the small side. Nonetheless, this dual video baby monitor remains as our top pick for the best baby monitor for multiple rooms so if you have a few children that you need to keep an eye on. Another dual baby monitor that ranks high in our books is the DBPower Digital Sound Activated Video Record Baby Monitor. Very similar to the summer infant dual view monitor in that it is also a multi camera baby monitor (supports up to 4 camera units) with two-way talk and sound activated LED lights, the DBPower actually offers more with room temperature monitor and alert,nightlight and lullaby. What sets it apart is its digital video recording function that has a sound-triggered automatic video recording function so that you will not miss any precious moments. Otherwise, there is a manual video recording function too for you to share moments with your family members and friends. It also has a bigger screen than the summer infant dual view at 4.3 inches - definitely a plus especially when you are in quad-view mode. Other features to enhance your viewing pleasure is its pan-tilt-zoom functions, which rotate up to 270 degrees horizontal and 110 degree vertical so that your field of vision is extended to up to 95% of your room. The volume of the visual and audible alert for low battery, out of range, temperature and baby crying can be adjusted from 0 to 6, so you have the flexibility to turn up the beeping warning when you are watching TV, or shut it down when you need some sleep. The DBPower system supports split-screen and auto-scanning, although you can manually switch when multiple cameras are paired. However, we suggest Auto Scan mode for smoother pictures. One thing with the DBPower Digital Sound Activated Video Record Baby Monitor is that it only comes with 1 camera unit despite being a split screen baby monitor. This means that you will need to purchase at least another camera unit should you wish to use it as a dual camera baby monitor, which is pretty much the purpose of many who bought it. Nonetheless, it is still slightly cheaper than the summer infant dual monitor with the additional camera cost, and with so many additional features, the DBPower Baby Monitor remains a top favourite dual view baby monitor of many parents to date. Many of you would have known the vtech baby monitor vm342 (given that there are so many vtech vm342 reviews around) but what we'd like to talk about today is the VTech VM343 Video Baby Monitor, an updated and better version of the vtech vm342 in all aspects. This is a baby monitor with 2 cameras and split screen functionality that comes with a high resolution 4.3" colour LCD screen and operates on a 2.4GHz digital transmission system (making your videos private and secure while cutting down on background noise) that is able to send audio and video signals up to 1000 feet. This is why it is also rated as one of the best long range baby monitor of this type (click here to find out what is the other type of long range baby monitor if you wish to know more) and the camera is able to pan up to 270 degrees side-to-side and tilts as many as 120 degrees up and down to allow you watch your little one as s/he moves about in the room. There are many top rated baby monitors in the market, but none is quite like the VTech baby monitor camera in terms of extendability for this nursery camera can extend up to 8 (!) cameras in total, making it the perfect multi room baby monitor to have. You can choose how you want to keep an on your family—single view (one camera only), split-screen viewing (all paired cameras at once) and patrol mode (single view that transitions to a different camera every 10 seconds). The pan, tilt and zoom function of the camera can be remote-controlled from the parent unit or if you wish, you can use the sound and motion activation mode. There is also a temperature sensor and automatic infrared night vision as well as a two-way, talk-back intercom system that lets baby hear the sound of your voice. As you can see, the VTech VM343 Video Baby Monitor is definitely one of the best dual screen monitors out there with features and a price that you cannot not love (it is one of the cheaper dual screen camera compare to others in the market). If you have several children that you need to keep an eye on and even a baby monitor with 3 cameras is not enough, this is the best video baby monitor for you. Here is our project nursery baby monitor review take - another highly sought after baby monitor with two screens that is not quite your average standard monitor. First of all, the project nursery baby monitor has a 5 inch HD colour LCD display screen which is an absolute dream come true for those that are looking for a large screen baby monitor. Don't underestimate what a slight inch of difference it can make - you get to see baby so much more clearer and closer in split screen mode without having to squint each time. Next is its navigation system. Breaking away from the generic user interface, Project Nursery made an easy to use icon menu and intuitive centric navigation wheel on both the 5” main monitor and 1.5” mini monitor (more below). Parents can quickly jump to the most commonly needed features of the monitor they are using without wasting time clicking through excess menus or navigating difficult camera controls. The navigation wheel allows parents to easily and quickly pan, tilt and zoom to the area they want to see while the main monitor unit also serves as a digital clock, timer and room thermometer. The two way communication lets you soothe with the sound of your voice, and you can also play Rockabye Baby lullabies, white noise and natural sounds to help baby sleep better. But perhaps the biggest feature worth mentioning is the 1.5" mini monitor, which is also the world's smallest monitor that can be attached to a wristband, lanyard or clip so that parents can always catch a glance at baby while having both their hands free to do other things. We think this is an absolutely brilliant add-on feature because you don't have to tether the parent unit wherever you go which can be quite inconvenient sometimes especially when you need to have both hands free to do your chores. The mini monitor shares many of the same features used by the main 5” parent unit in a very small package with up to 8 hours of battery life (the parent unit has up to 16 hours). The project nursery video baby monitor system utilizes the 2.4Ghz wireless camera connection technology for a secure wireless camera connection without the insecurities or technical set up of a wifi network. It allows up to 4 cameras (sold separately) to be connected to one system after which you can view camera feeds side by side, in a quad view mode, or even set a cycle for the different camera feeds. The only thing is, the Project Nursery 5" HD Baby Monitor is not cheap and is perhaps the biggest setback that stop many parents, but if you can afford it, it is definitely one double camera baby monitor that is worth the investment made. Another double baby monitor that is very popular (just look at the samsung video baby monitor reviews floating around the internet and you will know where we're coming from) in the dual screen department is the Samsung Wisenet BrightView Baby Video Monitoring System, otherwise also known as the Samsung Baby Monitor 3043. If you want a fuss-free samsung baby monitor with two cameras, this is the one to go for because it is just so easy to set up and use - simply plug in and position the camera, ensure that your monitor is paired with the camera and use the intuitive touch controls to begin controlling the baby monitor. Similar to the project nursery baby monitor, this samsung multi screen monitor also has a 5" display screen but better - it is a touch screen monitor that allows you to navigate the interface easily, just like your mobile phone! You can pan and tilt the camera around to your desired position to look at your baby or take a better look at the rest of the room. 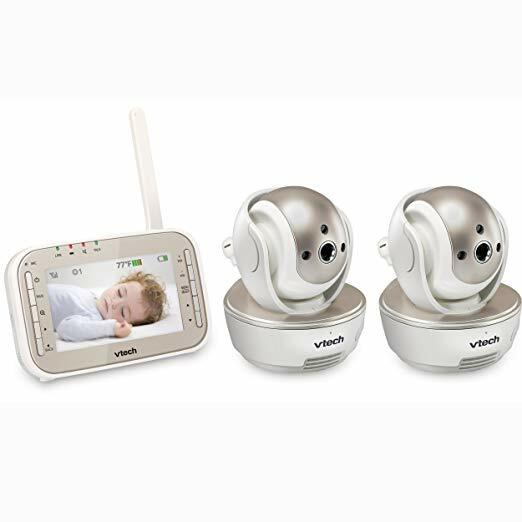 Its samsung 2 camera baby monitoring system monitoring kit can help you put your little one to sleep with its 4 pre-programmed lullabies and a soft, comforting night-light and the monitor even lets you set up feeding schedules alerts. The convenient belt clip and built in stand on the unit makes this samsung video baby monitor ultra-portable. As pictured left which shows the samsung multi screen display, this can be made into a 4 camera baby monitor too to let you view 4 areas at the same time. However, you do need to buy the other 2 cameras separately to achieve this. There are many samsung baby monitor camera models in the market, but amongst all, we think that the Samsung Wisenet Baby Monitor is its best 2 camera baby monitor that holds its ground amongst the many competitions in the market. With a long range of up to 900ft, it is also one good long range baby monitor if this is also one of your search criteria. Of course, we cannot forget the Motorola 2 video baby monitor when we're talking about best dual camera baby monitor. Amongst the many models the brand has produced, the Motorola MBP36XL-2 Portable Video Baby Monitor is the motorola baby camera that stands out the best. Quite different from the rest in terms of portability, the motorola split screen baby monitor allows you to unplug the battery-powered cameras and carry them with you from room to room for up to 3 hours on a single charge. Of course, if you want to securely in just one position, that is doable too with the included StarGrip support stand that easily attaches to shelves, brackets, and more. Further, this video camera baby monitor allow you to remotely pan, tilt, and zoom the cameras to ensure you always have the perfect view of your child. This motorola baby monitor two cameras unit has an ergonomic parent unit with room temperature display that lets you know know if their room is too hot or too cold. The infrared night vision allows clear view of the room day or night, and a two-way communication system with 5 lullabies allows you to soothe and comfort baby remotely. Similar to the samsung brightview multiple cameras, this one here has a 5" baby screen too and the split screen camera lets you watch real-time video of two rooms at once on the ergonomic parent unit. Undoubtedly one of the best two camera baby monitor, the Motorola MBP36XL-2 Portable Video Baby Monitor is also one of the best long range baby monitor with a coverage of up to 1000ft with out-of-range alert. Not restricted as just the best dual camera baby monitor, it is also expandable up to 4 cameras in the event you need more surveillance in other rooms. We've mentioned several times about the long range baby monitor in our review above. Do you know that you do not have to be confined in the same house or coverage range anymore to monitor your baby? Yes, you can remotely watch your baby's movement even when you go travelling or working. Find out how here! Monitor your baby even closely - by movement!